Line bottom of 13″x9″ pan with half the tortillas. Combine ground beef, tomatoes, & seasonings. Spread on top of tortillas. Add another layer of tortillas. Mix cottage cheese, 1 c. Cheddar, 1 c. Mozzarella, eggs; spread on top of tortillas. Bake at 350°F for 30 – 40 minutes. Remove from oven & top with remaining cheeses. Garnish with chopped green onions & black olives. From Favorite Brand Name Recipes, Vol. 7, No. 70, October 12, 2004. Spray 3 qt. shallow baking dish with cooking spray. 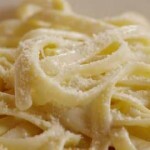 Mix 1½ c. sauce, ricotta cheese, ½ c. Parmesan cheese & pasta in prepared dish. Spread remaining sauce over pasta mixture. Sprinkle with remaining Parmesan cheese. Cover. Bake at 400°F for 25 minutes or until hot. Arrange cheese balls randomly over pasta mixture. Place sliced olive on each cheese ball. Let stand 10 minutes before serving. Chef’s Note: If fresh mozzarella balls are not available, substitute 1 package (8 oz.) fresh mozzarella. Cut crosswise into thirds. Cut each third in 6 wedges, for triangle shaped eyes. 5.8 effective grams of net grams of carbohydrates per serving. Saute lean ground beef in frying pan with mushrooms, garlic, onion, celery & Italian seasonings. Fry until the meat is no longer pink. Drain any excess oil & remove. Peel eggplant & slice it very thin. Grease bottom & sides of a 9″x13″ glass baking dish with olive oil on bottom & sides. Layer half the eggplant on bottom of pan. Sprinkle eggplant with additional Italian seasoning if desired. Layer half of the meat mixture, half of the sauce & half of the provolone (lasagna style). Repeat layering with remaining eggplant, meat, sauce & provolone. Spread mozzarella over the top of the casserole, cover with foil & bake for approximately 45 minutes or until done, taking foil off last 5-10 minutes to brown.